Frederick Singleton Martin enlists. Frederick is commemorated on the Centenary of WWI in Orange Honour Roll; he would be killed in action in France on 30 March 1918. Joseph Dempsey enlists. Joseph is commemorated on the Centenary of WWI in Orange Honour Roll; he would die of wounds in France on 12 August 1918. 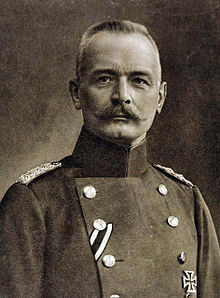 Chief of the German General Staff, General Erich von Falkenhayn. Fearing British retaliatory raids for German airship raids against London, Chief of the German General Staff General Erich von Falkenhayn issues a statement pointing out that German Army airships are restricted to bombing London’s docks and harbor works and are prohibited from attacking the central City of London. 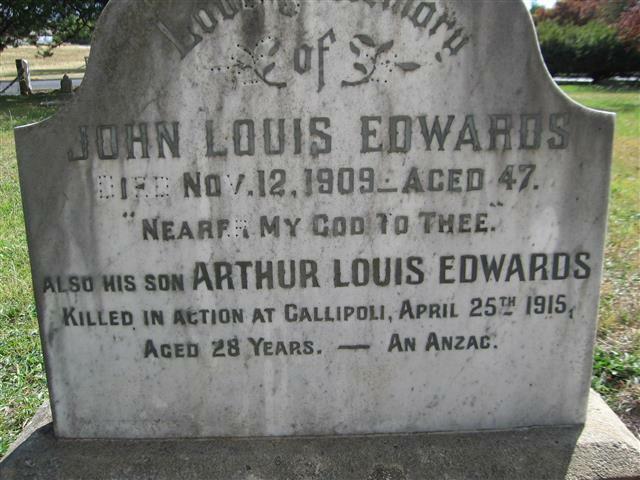 Arthur Louis Edwards was born in Balmain in 1886 to John Louis Edwards and his wife, Rachel. He attended Armidale Public School where he served in the NSW Public School Cadets. Arthur’s father, John, died in Orange in 1909, aged 47. 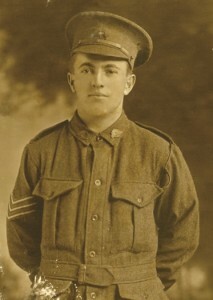 Arthur was working as a Clerk for the Armidale Railway Service when he enlisted in August 1914. 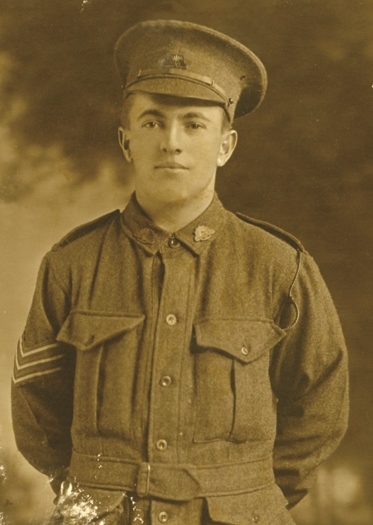 He was assigned the rank of Private and placed in the 1st Infantry Brigade 2nd Battalion, 1st Division AIF. He embarked at Sydney on the HMAT A23 Suffolk in October 1914 and disembarked at Alexandria in December. In February 1915 Private Edwards was transferred to Brigade Headquarters at Mena. It appears that he proceeded to Gallipoli on 25 April, but his movements are unclear. Arthur’s mother had not heard from him for some months and did not know of his fate. In September she asked the Archdeacon of Armidale, where she was living, to write to the War Office, requesting information. A reply to the Archdeacon’s request from the Base Records Office advised that “no official report that he was killed in action, or to any other effect, has been received”. The Armidale Chronicle reported Arthur’s death on 20 November 1915. Arthur is commemorated on the Lone Pine Memorial, Gallipoli and the Armidale World War I Memorial Fountain. He is also commemorated on his father’s grave in Orange Cemetery. Arthur Louis Edwards’ commemorative plaque, Orange Cemetery. Thomas Meynell Curtayne enlists. Thomas is commemorated on the Centenary of WWI in Orange Honour Roll; he would be killed in action in France on 4 August 1916. Charles Stuart Taylor enlists. Charles is commemorated on the Centenary of WWI in Orange Honour Roll; he would die of wounds in France on 30 October 1916. Mervyn George Hawkins enlists. Mervyn is commemorated on the Centenary of WWI in Orange Honour Roll; he would die of wounds in France on 25 July 1916. Rupert Edwin Thomas Richardson was born in Orange in 1894, the third child and first son of Henry and Jane Richardson. Henry and Jane had nine children, all of whom were born in Orange, where Henry worked as a builder. The family later relocated to Sydney. In 1915 Rupert was living with his family in Double Bay and working as a shop assistant. He enlisted in WWI in September that year and embarked five weeks later for training in the deserts of Egypt. It was here that the 56th Battalion was formed and Rupert was appointed Temporary Corporal. On 22 June 1916 Rupert’s unit embarked at Alexandria, bound for Marseilles. After a week at sea, a four-day train trip and a two-day march the 5th Division arrived in the village of Estaires on the Western Front. Fight for life at 4A Farm charge started at 6pm and 53rd Battalion got as far as railway 4th line but owing to other battalions of other Brigades failing to go through had to retire at 1.30am to a small line thrown up by us then later into their first line the fight was great but oh my God who could imagine a war like this we cut them down in dozens. I was on the machine gun. We held on until 10am where we were forced to retire to our own line under a hail of shells, bombs and machine gun fire. You never saw such a sight. Well the 14th Brigade need have no fear of its honour after this for the deeds done there were simply great, our purpose gained British advance 5 miles on the Somme. The five mile advance had come at a huge price; the 5th Division had sustained 5,533 casualties, including 1,917 killed, 3,146 wounded and 470 taken as prisoners of war. This would later be described as the worst 24 hours in Australia’s military history. Rupert spent the next few months on trench garrison duty in the Fleurbaix region, battling wet and muddy conditions as the northern winter set in. In April 1917 the 56th Battalion succeeded in taking the village of Louveral from the retreating German army. It was during this battle that Rupert sustained a gunshot wound to the chest, which resulted in the loss of one lung. He was transferred to England, where he spent the next 18 months recovering. During his convalescence Rupert took the opportunity to spend time with his father’s family at Hull in Yorkshire. 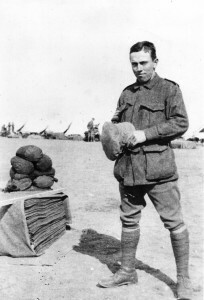 Rupert arrived back in Australia in March 1919, having served for three and a half years. He returned to retailing, leasing a drapery business in Lindfield from Ernest Duval. He met Ernest’s daughter, Vera, whom he married in February 1926. Rupert obtained a War Service Loan from the Commonwealth Government, with which he purchased a block of land in Lindfield, and, with the help of his father, built a home. Rupert and Vera had three daughters, Marcia in 1927, Barbara in 1930 and Gretel in 1932. During the 1930s Rupert worked for the Australian Red Cross. His role involved travelling throughout regional NSW establishing new branches of the organisation. In 1940 Rupert enlisted in WWII. He served for four years as a Warrant Officer in the Citizen Military Forces at the Army Records Office in Sydney. He later helped to establish the Commonwealth Reconstruction Training Scheme which retrained returned servicemen. Rupert was an active member of various organisations including the Chamber of Commerce, the Progress Association and the United Australia Party. Rupert died at the Concord Repatriation General Hospital in Sydney in April 1960. Rupert’s brother John Henry Lewis Richardson also fought in WWI. Rupert Edwin Thomas Richardson in Egypt.